The press review testifies to the center’s scientific activities and the interest raised by its guest researchers in the public debate in the Czech Republic and East-Central Europe. “Autochtones et christianisme orthodoxe au Détroit de Béring : contribution des études arctiques à l’anthropologie du religieux”. An article by Virginie Vaté, anthropologist, research fellow at CNRS / CEFRES in Prague. Research conducted with Marie-Amélie Salabelle (Laboratoire d’Anthropologie Sociale, CNRS / EHESS / Collège de France), also anthropologist. Monthly letter from the Institute of Social Sciences and Humanities of CNRS, 3/2019. “Lov v Evropě stojí na důležité křižovatce”. Interview with Luděk Brož (Institute of Ethnology, Czech Academy of Sciences / CEFRES) about the TANDEM program and his research project “Bewildering Boar”. Luděk Svoboda, AV ČR, Akademický bulletin 1/2019. “Multiple perspectives on wild boar proliferation at research symposium in Prague”. A review of the research symposium “Porcine Futures 1: Re-negotiating “Wilderness” in More-than-human Worlds” which took place on 16 and 17 October 2018. Erica von Essen, Swedish University of Agricultural Sciences, 31-10-2018. “Praha hostila konferenci o „divočině” ve světech více než lidských”. A review of the international workshop “Porcine Futures 1: Re-negotiating “Wilderness” in More-than-human Worlds” organized by the team of Bewildering Boar project at CEFRES – Aníbal Arregui, Luděk Brož, Marianna Szczygielska and Virginie Vaté together with Erica von Essen (Swedish University of Agricultural Sciences) on 16 and 17 October 2018. Jana Olivová, Czech Academy of Sciences, 22-10-2018. “Il faut refaire parler de l’Europe centrale en France”, Clara Royer’s interview with Ludovic Lepeltier-Kutasi, for the on-line journal Le Courrier d’Europe centrale, 5-10-2018. “Les transferts culturels entre l’Europe médiane et Paris au XIXe siècle”. Adéla Klinerová (CEFRES, FF UK, EPHE) and Kristýna Hochmuth (National Gallery, Prague) about the workshop “When all paths led to Paris” devoted to artistic exchanges between France and Central Europe and organized by CEFRES 26 & 27 June 2018. Pierre Meignan, Radio Praha, 11-7- 2018. Annette Wieviorka is a historian, specializing in the Holocaust history. She delivered a lecture in Prague, organized by CEFRES, the Prague Centre for Jewish Studies (Faculty of Arts, Charles University) and the Institute of Contemporary History (Czech Academy of Sciences). She also delivered a lecture-debate about the disputes in Europe from 1968 to 2018, organized by the French Institute of Prague and the think tank Europeum. Radio Prague met her in order to talk about the Prague Spring and the role of historians in today’s society with her. Report from the first session of the European seminar Critical news organized by the École normale supérieure in partnership with CEFRES. The event took place on the 25th of January at the French Institute in Prague. Nicolas Thervet, ENS-PSL, 2018. Emmanuel Laurentin will discuss the political and cultural connotations of the history of Central Europe in his programme La Fabrique de l’histoire on France Culture between 18th and 21st december 2017. Institut français de Prague. Novembre 2017. Radio report on the round table and workshop of Fabrique de l’Histoire organised by France Culture in collaboration with CEFRES and IFP on 13th november 2017 on the subject of Central Europe and its historical nestalgies (Europe centrale et ses nostalgies historiques). S. Cazabon, Radio Praha, 15th november 2017. Interview with Kateřina Čapková (Insitute of Contemporary History, Czech Academy of Sciences) about the international conference she organized in collaboration with CEFRES in Prague 23-25 May 2017 : “New Approaches to the History of the Jews under Communism”. L. Matušková, Český rozhlas, 18 June 2017. Czech translation of Roger Chartier’s lecture held in Prague, 18 May 2016, at the French Institute: (translation by Anna Machová), Knihovna: knihovnická revue, Vol. 28, 2017-1, p. 45-56. A review of the international conference “Translating from French in Central Europe in the 20th century: Political and Cultural Contexts (Hungary, Czech Lands, Poland, Slovakia)”, Bratislava, 16-17 May 2017, by Ľ. Suballyová. Slovakian Academy of Sciences, 30.5.2017. During her stay in Prague as a Visegrad guest, Laure Teulières, historian of emigration at the University Jean Jaurès in Toulouse gave an interview about the stakes of immigration to come for Europe. She stated that we must keep in mind the historical diversity of European countries and therefore the very distinct point of views about this sensitive question, which is source of tension in the Czech republic and other Central European countries. Radio Prague, on the 3.05.2017. “Written Culture and Society in the Bohemian Lands 16th–18th Century Workshop in Honour of Roger Chartier, 18 May 2016” Compte rendu par Katalin Pataki, Cornova, vol. 6 n° 2 2016, p. 114-116.
Review of the lecture arranged by Kateřina Čapková (Institut d’histoire contemporaine, AV ČR), Eliyana Adler (The Pennsylvania State University) and Ruth Leiserowitz (German Historical Institute, Warsaw). (Istvan Pal Adam H-Soz-Kult 15.3.2017 – 16.03.2017). The Czech translation of Bernard LAHIRE’s lecture organized by CEFRES on 8 October 2015 was published in Czech Sociological Review (1 / 2017) with an introduction by Marek Skovajsa. Invited at the Night of Philosophy in Prague, Miklós Gaspár Tamás reflected upon the perils of capitalism and liberal democracy, and criticized the current policy of European countries (a2larm, 26/07/2016). Miklós G. Tamás talks about the political situation in Hungary and his own experience in the political sphere (Nový Prostor, 21/07/2016). 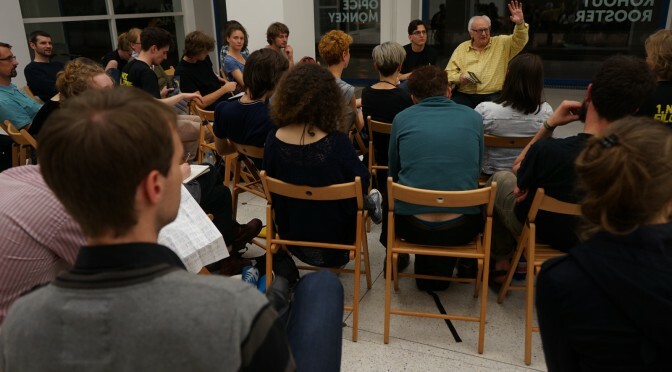 Shortly after the Night of Philosophy, Étienne Balibar gave an interview on the French political situation, discussing subjects such as Islam, laïcité, communism and freedom of speech (Lidové noviny, 09/07/2016). The French writer Claire Marin, guest of the Night of Philosophy, gave an interview on her writing experience (Hospodářské noviny, 17/06/2016). During his stay in Prague in the frame of CEFRES Platform lectures, Pierre Lascoumes gave an interview on the corruption of political elites in France and worldwide (Lidové noviny, 16/05/2016). During her stay in Prague as a Visegrad guest, Ioana Popa introduced her work on the translation of East European literatures in France during the Cold War (French Radio Prague, 21/04/2016). During his stay in Prague as a Visegrad Forum guest, Michel Wieviorka gave an interview on the political situation in Europe (Deník Referendum, 26/03/2016). In this interview, Michel Wieviorka talks about the refugee crisis in Europe (Lidové noviny, 06/03/2016). Michel Wieviorka appears on the TV program “Události, komentáře” and shares his view on the political tensions among EU members, particularly about the refugee crisis (ČT24, 24/02/2016).